Dental implants are as durable as original teeth and can last a lifetime. For many years, the only solutions to missing teeth have been dentures, crowns and bridges, all of which are either temporary or difficult to maintain. Happily, today we have another option – dental implants –which provide a natural-looking, permanent solution to your missing teeth. 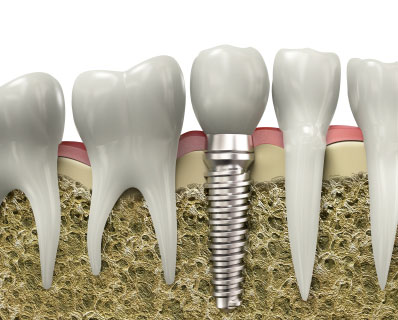 A dental implant can support individual crowns, multiple crowns and even dentures. If you are missing a single tooth, multiple teeth or all of your teeth, you may be a viable candidate for implants. Dental implants are as durable as original teeth and can last a lifetime. Implants act like natural teeth, stimulating bone growth and preserving your natural facial structure. Tooth implants are attached to your jaw, so they will never slip or rub, allowing you eat what you like! They function and feel exactly like natural teeth, and they are easy to care for. Unlike bridges and dentures, implants do not damage to surrounding teeth. Implants are constructed from Titanium alloy, which is made to mimic and replace your natural tooth root. Once inserted, they become a permanent part of your jaw. Connected to each implant is an abutment, which protrudes from your gum line. On top of this abutment is placed a crown, which is an artificial tooth that is custom fabricated to match the shape of your natural teeth. Advancements are being made to the design of implants every year, and candidates now have many implant options to choose from. Even people who have a jaw with “narrow bone” can now be considered as a candidate for grafting in preparation for implants. To accurately determine the answers to these two questions, Dr. Dean will review your individual history, health, and specific dental needs.